Paige Poppe is a creative entrepreneur who paints incredible custom graphics on skate decks, and recently launched the Studio Skate Co. with the help of a successful Kickstarter campaign. 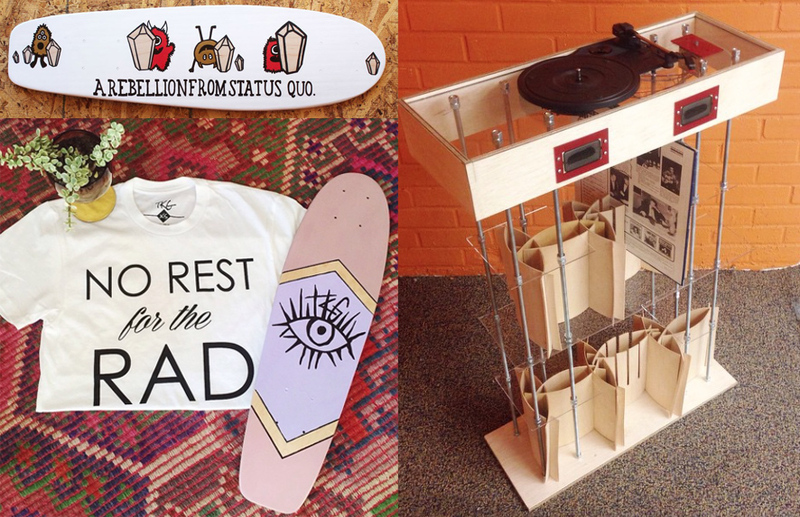 She has also started to make her own custom decks, using Roarockit's Thin Air Press technology, as canvasses for her work. We were able to chat with Paige about her experiences crowdfunding, making boards and the future of Studio Skate. How did you get started doing your artwork on decks? Paige - I learned how to longboard in high school and got so into it! I bought a deck at my local skate shop, but none of the graphics were 100% me, so I figured why not design my own? I started by woodburning myself a longboard, and then started painting more as gifts from my friends. They loved how personalized they were and I loved working with the unique canvas! So I opened up an Etsy shop and continued painting and offering custom decks. With so many skateboard related projects looking to crowd funding to help get started, do you have any advice or experiences from your own Kickstarter campaign that you would like to share? Paige - Since I already had an Etsy shop, the Kickstarter was my way of taking my business more seriously. I created a name for my business, Studio Skate, and designed a logo. I think creating a solid logo + graphics really helped my project get successfully funded! It also helped me to have existing customers of my art and a following from my blog where I was sharing my pieces. I reached out to those people who were already attracted to my work, and they wanted to see Studio Skate become a reality! My final piece of advice is to utilize social media. My favorite is Instagram, and I have made so many connections with people through that community. P.S. You can find me there @paigepoppe and I'd love if you stopped by to say hey! How did you hear about Roarockit? How has it changed your business? Paige - Speaking of Instagram, I heard about Roarockit in the most roundabout way! Here's the story: I was promoting my Kickstarter through Instagram posts during my last month of study abroad while living in Copenhagen. I found a Danish skateboard company called Parfa Crew on Instagram and really liked their graphics. I left a comment and followed their account. Next thing I know, the owner Palle had donated to my Kickstarter and asked if I would like to stop by his studio and chat. He was so kind and showed me how he runs his business, and that's when he showed me the Roarockit technology! I was so excited to find out about this skateboard making method because I knew I wouldn't have access to power tools over the summer. I am really grateful to Palle for teaching me about Roarockit, and I love this company for making creativity possible! I get so much joy out of creating my entire process, from shaping to painting by hand, and Roarockit makes that possible. What have been some of your favorite projects so far? Paige - I *love* working with clients to create custom deck art for them, but I am especially proud of starting to work with apparel brands to create logo decks for them. Recently I've worked with State Forty Eight, Salt City Emporium, and Top Knot Goods! They're all rad people behind rad companies who support local + handmade artists. I also made a record player and used the Thin Air Press for part of the construction to create some wood arcs that are structural + hold records! What do you see in the future for the Studio Skate? Paige - I would love to continue working with brands + clients to create handmade + handprinted decks. The beauty of what I do is that it is 100% custom, so the outcome is always fun!